This thread will be about "Arduebot" (not "Ardubot"), the robot which basically is mostly the Arduino Due board itself. Ok, if you look carefully you might say that it is not a Due but a Mega on top of the peg-board. Before loosing the next Due [I still have 2 ;-)] I will give the Mega with L293D motor driver a try. The main reason I will use a Due is its incredible power (84MHz, with overclocking even 114MHz) and the huge ram size (96KB) compared to all other Arduino models. (see my point of view on Arduino Due versus Arduino Zero). It is even powerful enough to drive a 800x600 monochrome VGA monitor by itself with just 3 resisitors (DueVGA). Asuro was able to run with 0.43m/s maximally by default, tuned it was able to run 1.8m/s with 70mm wheels(!). 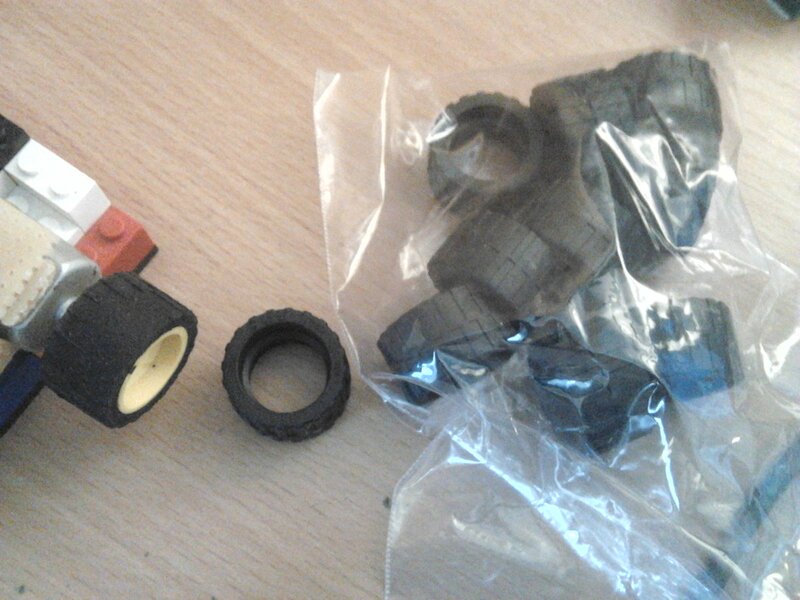 It turned out that the best were the Lego wheels, and among them 20, 24 and 30mm diameter were best. Record was achieved with 24mm, and that is the reason I go with that wheel for now. What the youtube video of the 3.1m/s run in that posting shows is that the robot does run totally straight, without any help with both motors powered fully. I recently tested other bot platforms with a 3rd (or even 4th) small wheel instead of half table tennis ball. These robots cannot go straight, I needed 15 runs with the circular robot to get a slowmo video allowing me to measure linear speed by inspecting slowmo frame by frame. I mentioned the plan of having a camera on Arduebot, and the plan is to use it for linefollowing as well. Taking a picture just before the front of Arduebot would be equivalent to using infrared LED and photo resistors I did back in 2007. But taking more of the picture ahead into account should give Arduebot a view of the line follwing course "in the near future" as well, which should hopefully make control of speedy linefollowing better. I have to admit that I did damage the Mega partially, it needs 5 or 6 flash attempts after powering on before the first flashing succeeds (following flashing is fine then). The Mega showed unexplainable behavior when Vin was powered with 12V. So I replaced the Mega with a working Arduino Due. It is really loud noise both motors made(! ), and I had to press very hard to fixate Arduebot. OK, next I fixated the wheel again with a drop of superglue on the motor axis -- but I was not careful enough, a bit of superglue went down the axis into the motor. I noticed that and immediately powered the motor with the 9.7V block battery. 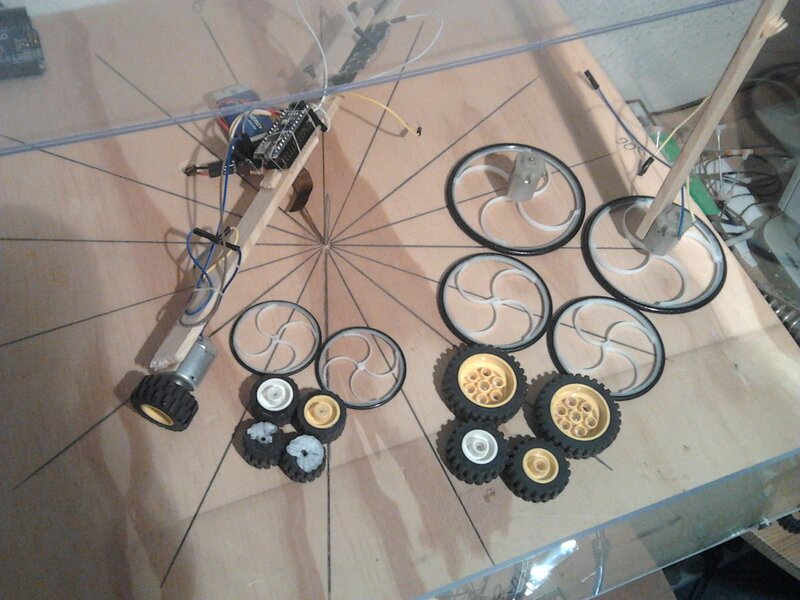 It did not start, but after I rotated the wheel with my fingers it began to start and then turned quickly, but over time it got slower and slower, and I lost that motor. Superglue is a cool material, but also a dangerous! And it took quite some more time to completely remove the remainder of the connector mini peg-boards between motor and main peg-board from what photo shows (in order to get a flat glueing surface again). As can be seen the black box with 3 LiPos giving >12V is superglued below main peg-board as well as half the table tennis ball (unfortunately the 4th screw connecting Due and peg-board is inside the half table tennis ball, so whenever Due needs to be changed, the ball has to be removed. I added two blue LEDs on the mini-breadboard in order to have graphical markers that I can turn on/off in [slowmo] videos taken from Arduebot. I did first runs with Arduebot, but given by the length of the room speed cannot be high. This picture is overlay of movie frame parts at 8.216666s and at 8.499999s, and Arduebot did more than 50cm in that time frame (the two blue LEDs are on border of 50cmx50cm floor tiles). That is 0.5/(8.499999-8.216666)=1.76m/s (6.35km/h) -- again, this is with only PWM=99 (and 12.06V). Use a little hot glue, strong but easy to remove. I will give that a try next time I have to change a motor -- did buy hot glue and hot glue pistol some time ago, but never used it sofar. Just before loosing power, still in acceleration, Arduebot did (more than) 4.05m/s circular speed. "displayed forward/backward at original speed and three times slower." "displayed forward/backward at speed 3.6 times slower and 12 times slower than original 120fps." It is the centroid of triangle built from inner points of wheels and center of half table tennis ball (where it touches ground). Below is the animation again, only 12 times slower than original this time. And picture of one frame with the three points mentioned (blue) and the computed centroid (white). Analyzing frame by frame on rowvid.com shows that 2.08m/s circular speed was achieved, only half of the free circular run of Arduebot on the floor tiles (see slowmo in single frame viewer). You can hear it easily that Arduebot was not able to hold road contact all the time. rowvid.com frame-by-frame analysis shows 2.41m/s circular speed, still far away from the 4.05m/s seen in free Arduebot circular run. This will be it with my circular Arduebot runs, those in MTS are too slow, and free circular run as last weekend has potential to destroy Arduebot if not lucky as on last weekend where Arduebot got powered off avoiding damage. Next step is linear running Arduebot as discussed above. On Monday I went to basement of IBM Böblingen lab and found a 25m and a 40m straight wall without any dent. The 25m basement corridor has a slight altitude differnce allowing to compare "uphill" and "downhill" runs, the 40m dentless wall corridor is flat. The sensor gives measurements every 39ms, which would give a measurement every 19.5cm only if running with 5m/s. Since that's all new I did want to take an abbreviation on the way to determine maximal linear Arduebot speed. Today I built "esp12ebot == Arduebot - (Arduino Due + TB6612FNG) + (ESP8266-12E + L293D)"
First runs just pressing "forward" key turning esp12ebot to full speed had to be followed "║" in far less than a second to avoid damage. And esp12ebot drove crazy curves. Then I pressed ᐅ (start maximal speed stationary rotation, like here), and then the Android lost Wifi connection to the ESP8266-12E!! I had to wait some mintues of rotation (luckily esp12ebot not leaving the white floor tiles) until the LiPos were discharged and esp12ebot stopped with less than 6V left from >12V at start. I stopped my esp8266 controls motor in the past because voltage spikes made esp8266 restart terminating the much needed Wifi connection for control. I will go back to Arduebot immediately -- the nodemcu motor shield is really fine to play with slow gear motor robots at 6V, but definitely not for 12V motors as I do. Just ordered 10 new tires for 0.25€ in total. Next step is to use Arduino playground PID library with 2 IR distance sensor inputs and two motor outputs. This should allow to determine maximal linear speed by Arduebot driving in eg. 20cm distance to long (25/40m) dentless walls in IBM Böblingen lab basement. Both motors got very, very hot at the end, I would expect to have lost motor(s) if having used hot glue instead of superglue for connecting the motors to peg board. I measured some strange values with Sharp IR distance sensor and Arduino Due. Good that I measured the voltage arriving at sensor as well, was only 4.03V/3.01V when connected to 5V/3.3V from Due. 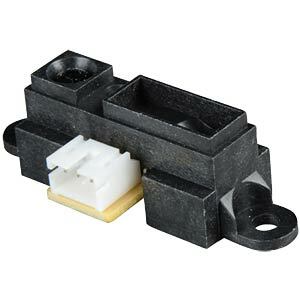 Sensor VCC will definitely be connected to 5V pin, and hopefully that will provide more voltage when Due Vin is powered by 3 LiPos with >12V. 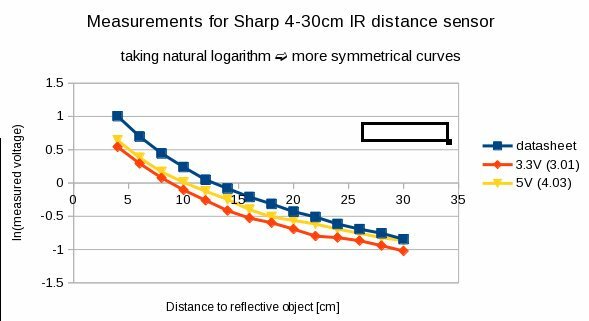 Datasheet shows that there is no risk for Due pin since Sharp sensor returns 3.1V maximally. My plan was to let Arduebot run full speed along a dentless wall with 15cm distance. Looking at 4.03V measurements 4cm/15cm/30cm gives 1.9V/0.72V/0.42V. The voltage difference wall side 1.18V is much bigger than the other side 0.3V. Perhaps Arduebot needs to run closer to the wall ... it all depends on how smoth the PID controller will make Arduebot run at constant distance to the wall. Here measured input with be "analogRead(A11)", and output will be "digitalWrite(DAC1, _)". Will be interesting how PID will adapt to the different resolutions (10bit/12bit). I followed the plan and played with DAC1➫A11 connection on Arduino Due as basis for a PID controller. So I did my first steps with Arduino PID Library and if you want to play with PID yourself, you should really read the detailed article series explaning the many design decisions for Arduino PID Library. Now adding a constant resulting in value 0 for the planned distance should be a good basis for PID controller. I read that controlling two motors of Arduebot with a single PID Output value can be done by driving both motor controllers at a specified speed value and just subtract the absolute vale of Output from the left/right in case of positive/negative Output value. The PID magic will also deal with slight speed differences between both motors. For the distance sensors perhaps just adding both distances as PID Input is possible. But it is also important whether the front or back sensor shows the minimal distance value, at least for the action needed (turn right/turn left). So the plan is to use PID library "SetTunings()" function to switch between two (or maybe three) sets of PID controller constants on whether Arduebot is direction front to wall or front away from wall (or inside a small band around Setpoint distance where no corrections are needed). I have not found articles dealing with "two distance sensors, drive parallel to wall" specifically. I will appreciate any pointer. Yesterday I posted on Arduino Uno proto shield is firm on Mega acrylic box around Due and works and at the end I said that I do not have direct plans for using that acrylic box for Arduino Due. Later I thought on that the box could replace the peg-board used with my first Arduebot completely. There are many Arduino bots, and there are even bots with Arduino Due like Ardubot. But this thread is about Arduebot, and I want to define what that is here now.